The Jewels in the Frame quilt block is for a patient person. There are lots of pieces, but the sewing is quite simple and methodical. 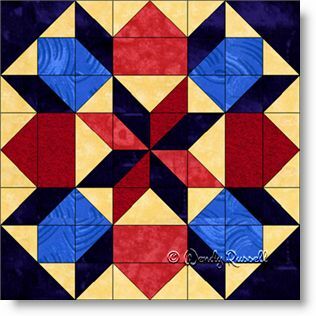 As a result, this block will be easy to construct if you take time to sew an accurate quarter inch seam allowance. Half square triangles are used both as the common patch (two triangles to make a square), as well as the use of the cut triangles on two adjacent sides of a square. (Since this is difficult to explain, look to the extreme corners of the block for clarification.) This is technically an eight patch block, but I chose to design the pattern as an uneven nine patch. The two sample quilts illustrated feature a side by side setting as well as an on point layout to get your creative juices going!